One. Great-Grandma Ruth Frith, a 100-year-old Australian, competes in the women’s 75+ shot put final at the World Masters Games in Sydney Olympic Park, and goes for gold. She trains five days a week and bench-presses 35 kg weights to stay in shape, Reuters said. Two. Chris Yee, 34, a Calgarian, visiting the city 45 km south of Vancouver, saw smoke billowing from a house and a panicked senior standing on the balcony at about 8 p.m. When the woman would not come down the balcony steps to safety alone, Yee and a neighbor climbed the stairs to the burning home and saved her. Three. Members of the Calgary’s Jewish community celebrated the 100th anniversary of the city’s first synagogue. Jacob Diamond and his wife were the first Jewish settlers to arrive in Calgary 120 years ago, but it was until 1909 when the first synagogue-the House of Jacob- was opened. Four. St. Catharines, Ont. 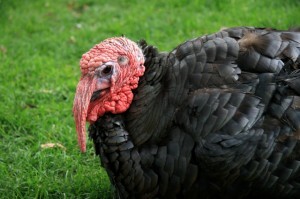 This is one Thanksgiving live turkey who is infamous for attacking city buses, cycling children, police cars and his own portrait to be put as a warning sign “Turkey crossing” by Chris Thomas at the front of his Aquadale Drive home. Five. Hugh Dillon, the star of two TV series – Durham County and Flashpoint – left rock music behind years ago but has recently returned to it with a new album, Works Well With Others. (Calgary Sun).